My favorite place to read as a child was under the covers with a flashlight. While the pleasure of being subversive and sticking it to The Man (who, in this case, happened to be a woman: my mom) no doubt played a role, more compelling was that I appreciated the sensory deprivation that facilitated disappearing into the world of a book. My bedroom, with its white furniture and riot of stuffed animals, vanished from view, and I could submerge myself into the alternate reality of wherever I was traveling to—the Metropolitan Museum of Art with Claudia from From the Mixed-Up Files of Mrs. Basil E. Frankweiler , London with Sarah Crewe from A Little Princess or Paddington from A Bear Called Paddington , turn-of-the-century Manhattan with the five sisters from All-of-a-Kind Family . “I have a mild obsession with it,” I joked. Reading in the dark, I realized in that moment, transports me back to my childhood and what reading represented (and still represents)—a trip to an alternate world and a new way of seeing my own. I don’t read under the covers anymore, but I still enjoy snuggling into bed, turning off the lights so the distractions of here-and-now fade away, and disappearing into a good story. Which is actually much more comfortably accomplished with a backlit e-reader than with a flashlight. When else do I gravitate towards my e-reader? Instant gratification: When I want a book, and I want it now, I do have a tendency to download it onto my e-reader. Paradoxically, this should also be my least favorite thing about my e-reader because impatience is my fatal flaw. Book overload. 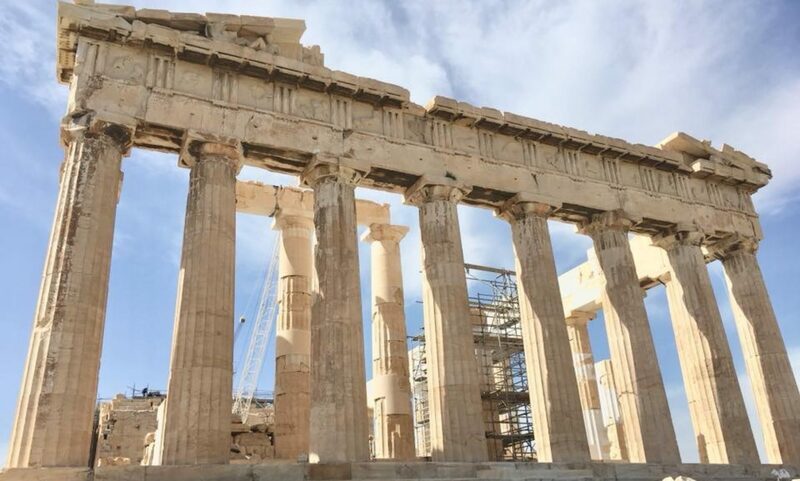 An anecdote I enjoy telling because it shows me at my most ridiculous: A few years ago, I tore my rotator cuff toting 25 books, at least half of which were hardcovers, on a summer trip to Greece. It took three months of physical therapy for me to regain full use of my right arm. In the ensuing years, I’ve reduced the number of paper books in my suitcase and loaded my Nook instead. Reading the classics. In truth, I’d much rather squire an artfully designed hardcover edition (have you seen the gorgeous Penguin Classics editions ?). But downloading free classics on my e-reader is nigh irresistible. It’s tough to argue against the appeal of free books, especially when they are truly excellent books! The tiny print problem. This is the most significant one for me. My eyesight is terrible, and even with corrective lenses, I don’t have anywhere near perfect vision. Books with small and/or densely packed print can be frustrating for me to read, and I have trouble reading in low lighting. My eyes begin to ache, my temples to throb from squinting. Enter the backlit e-reader, which allows me to manipulate the print to whatever size is easiest to read and make the screen as bright as needed. At times, the choice is between reading electronically and not being able to read at all. So it’s not so much that I’m obsessed with my e-reader, really, as I am grateful for it. I love this balanced view. 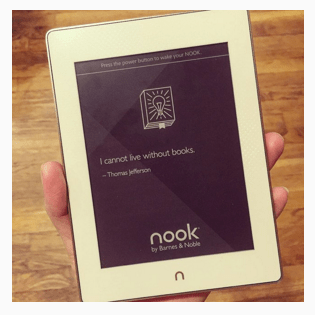 You clearly love physical books, but you also acknowledge that e-readers can be pretty great, too. I especially hear ya when it comes to traveling. I used to have issues with overweight baggage, like, all the time, back when I’d regularly travel between the US and France. Not as serious a problem as a torn rotator cuff (ouch! ), but still, not fun. Nowadays, because of my Kindle, I don’t have to worry about that kind of thing. 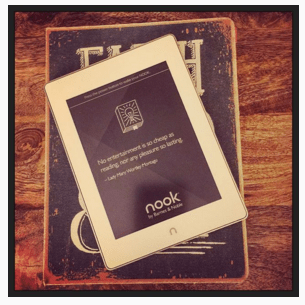 Your Nook Glowlight Plus sounds AWESOME. And like someone who really enjoys reading came up with it. A light AND it’s waterproof?! The day my Kindle is no more, this is what I’m going to replace it with! “And like someone who really enjoys reading came up with it.” –> It’s funny that you say this because I have thought that exact thing. It’s so user friendly and thoughtfully designed. I never thought I would actually love an e-reader, but I really do. It comes with me EVERYWHERE and is actually the one thing I never forget to bring with me.